Dr. Jane Lucas is a psychologist who answers questions from the public on her radio show "The Jane Lucas Show" and in a magazine. Where is this pretty woman? 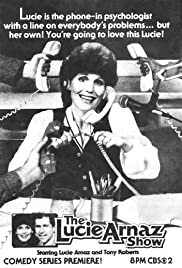 I can recall watching this series and enjoying it very much; not because of the story, but because of the soft nature and pretty appearance of Lucy Arnaz. I've not seen any of her work since this series ended, apart from a documentary style special that she made wherein she showed home movies made by her parents in their early married life. She'd stumbled across these movies after their deaths and was obviously very affected by what she saw in them. I was moved to hear that she hadn't been aware of the tremendous affection they'd had for each other in the early years. Lucy Arnaz is a naturally very pretty and wonderfully sincere woman who brings a warm feeling to her work. It sure would be nice to see her on screen again. Not in a ditsy sitcom but in a drama. I think she'd be a compelling actress in a serious film.